The Alesis Crimson II Mesh Electronic Drum Kit is a nine-piece beast that affords exceptional feel and expression. Incorporating Alesis' exclusive mesh drum heads across a full-kit layout, which are paired with a sophisticated drum module, you can perform and practise to your heart's content on what is a truly outstanding instrument. No matter what your skill level is, you can rest assured that the Crimson II will respond brilliantly in both the studio and on the stage. The Crimson II Kit includes 12-inch dual-zone snare, two 8-inch dual-zone rack toms, and a 10-inch dual-zone floor tom that provide a professional-level feel. Equipped with Alesis' patented tightly-woven black mesh heads, the rebound and response they give is nothing short of extraordinary. 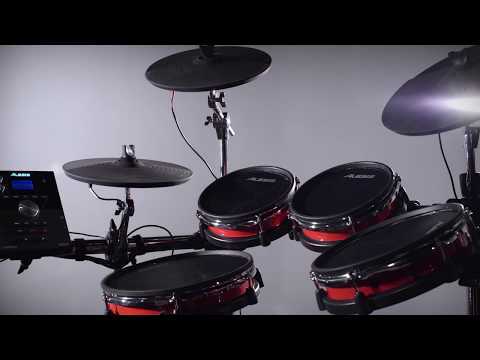 The Alesis Crimson Mesh also includes an 8-inch kick, 12-inch hi-hat with a pedal, a pair of 12-inch crashes with choke, and 14-inch three-zone ride so that your cymbal work can be formed with impeccable precision. Amazing crashes, crescendos, and a smooth ride will all be delivered with natural flair. All hardware is fitted across a premium quick lock chrome 4-post rack with separate double-braced snare stand so that you can play with as much intensity as you wish, safe in the knowledge that your Crimson II Mesh Kit will keep coming back for more. The Alesis Crimson II Drum Module boasts 74 drum kits (54 factory with 20 User editable) with over 671 sounds and a whopping 120 play-along tracks for you to hone your skills to. As you'd expect, there is a built-in metronome to keep you locked in time-wise, a real-time recorder for you to playback and critique your performances, and a, 1/8-inch input for playing along with an external audio source. With regard to outputs, there's a stereo pair 1/4-inch outputs, headphone outputs for silent practice, and a USB-MIDI output for triggering virtual instruments or recording to your DAW of choice. The Alesis Crimson II Mesh Electronic Drum Kit has a USB memory stick input, which enables you to load your own WAV samples into the kit. You can assign the samples to any part of the kit, giving you an exceptional breadth of control. Not only that, but WAV play-along tracks can be loaded to expand your practise and performance arsenal.